Scott Cleland is a proven thought leader and influential ‘Techlash’ precursor concerning Internet competition, policy, and unaccountability. He has a 26-year track record of being the first analyst/strategist to anticipate and navigate many major changes in communications and the Internet, initially for top institutional investors, and then for Fortune 100 companies in six industries. Cleland’s copious original Internet research over the last decade, in several hundred PrecursorBlog posts, consistently anticipated and documented the primary Internet unaccountability problem patterns that predictably have precipitated the current global ‘Techlash,’ i.e. Internet problem patterns with Internet policy, economics, security, accountability, antitrust, privacy, intellectual property, liability, and fraud. Cleland is Founder of Precursor Research LLC, a new 2019, Precursor® branded, investment-related start-up. Institutional Investor twice ranked him the #1 independent analyst in his field. He has been profiled in Fortune, Barrons, WSJ's Smart Money, Investors Business Daily, National Journal, and Broadcasting and Cable. He served as Deputy United States Coordinator for Communications and Information Policy in the George H. W. Bush Administration; and served on the U.S. State Department Advisory Committee on International Communications & Information Policy for six years in the W. Bush Administration and six years in the Obama Administration. Eight different Congressional subcommittees have sought Cleland’s expert testimony a total of sixteen times, and globally sixteen publications have featured his op-eds. He is the author of the 2011 book: Search & Destroy: Why You Can't Trust Google Inc., which has been translated into Portuguese and Korean. U.S. Congressional Subcommittees asked him to testify three times on Google; and governments on four continents have sought his Google expertise. That the $1 trillion fiber bubble part of the $4 trillion Dotcom bubble would burst because the market assumed annual data traffic growth was 12x faster than reality. 2018: How online network effects are exponentially more powerful than offline’s. From 2006-2018, Cleland was President of Precursor LLC, an Internet change research consultancy that served Fortune 100 companies in six industries; and author of the widely-read PrecursorBlog, publishing his Internet change research findings on Internet competition, policy, and unaccountability. An Internet expert’s expert, Precursor LLC helped corporate clients anticipate and navigate Internet changes to better exploit emerging opportunities and guard against emergent risks. Its specialty was original thinking in organizing chaos, by bringing clarity of thought and applying framework analysis to big complex internet competition, policy and unaccountability problems and issues before others. During that same period, Cleland also served as Chairman of NetCompetition®, a pro-competition e-forum supported by broadband interests. From 2000-2005, Cleland served institutional investors as Chairman and Chief Executive Officer of the Precursor Group Inc. He founded and co-built the Precursor Group Broker Dealer from scratch to the #1 Institutional Investor-recognized independent research firm in communications in four years. The firm served most of the top investment institutions in the U.S., including 39 of the top 50. At that time and in that role, Cleland was well-known as one of the most-widely quoted and interviewed analysts in the United States. Overall Cleland has thirteen years' experience in the institutional investment business including working for the Schwab Washington Research Group and then Legg Mason from 1993-1999. Scott Cleland served as a member of the U.S. Department of State’s Advisory Committee on International Communications and Information Policy for six years in the W. Bush Administration and six years in the Obama Administration. In 2002, Cleland conceived and was the Founding Chairman of the Investorside Research Association, the first and only association of independent research firms serving investors. Also, in 2002, Institutional Investor Magazine called Cleland "the de facto spokesperson for the independent research community." He was the lead source and primary analyst for Hedrick Smith's Emmy Award winning PBS Frontline Special, "The Wall Street Fix." Immediately following the surprise announcement of Enron's bankruptcy, Cleland was the first analyst asked to testify before Congress to explain how its then near record corporate fraud could happen. Scott Cleland's career as a public servant concluded in 1992 as the Deputy United States Coordinator for Communication and Information Policy at the U.S. Department of State, serving President H. W. Bush. Previously, Cleland served as a Senior Policy Advisor for Legislative Affairs to the then Secretary of State James A. Baker III. He received the Superior Honor Award for his role as the lead congressional briefer to Secretary Baker on all foreign policy matters during the first Gulf War and the dissolution of the former Soviet Union. Prior to that, he served as Director of Legislative Affairs for the U.S. Department of Treasury and as a Budget Examiner for OMB in the U.S. Executive Office of the President. 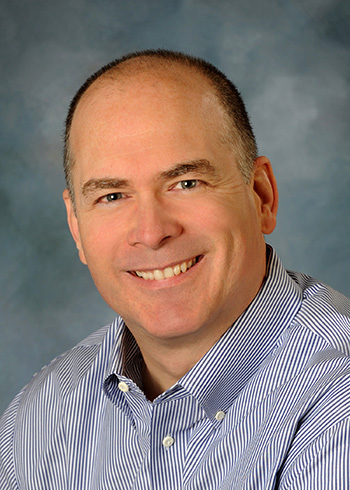 Scott Cleland earned a Master of Public Affairs from the LBJ School of Public Affairs at the University of Texas at Austin in 1984 and a BA in Political Science from Kalamazoo College in 1982. In 2000, Cleland earned Kalamazoo College's Distinguished Achievement Award. Why You Can't Trust Google Inc. This is the other side of the Google story—the unauthorized book that Google does not want you to read. 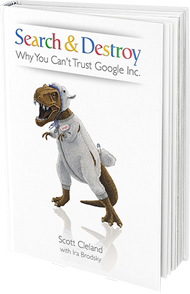 In Search & Destroy, Google expert Scott Cleland, shows that the world's most powerful company is not who it pretends to be. Google pretends to be a harmless lamb, but chose a full-size model of a Tyrannosaurus Rex as its mascot. Beware the T-Rex in sheep's clothing. Google has acquired far more information, both public and private, and has invented more ways to use it, than anyone in history. Information is power, and in Google's case, it's the power to influence and control virtually everything the Internet touches. House Judiciary Competition Subcommittee, 9-16-10, Hearing on "Competition in the Evolving Digital Marketplace," "The Evolving Competition Digital Dichotomy & Why Googleopoly is the Main Antitrust Event"
Joint House Energy & Commerce Subcommittee, 6-18-09, Joint Hearing on Behavioral Advertising, "Why A Consumer-Driven, Technology/Competition-Neutral, Privacy Framework Is Superior to a Default ‘Finders Keepers Losers Weepers' Privacy Framework"
House Energy & Commerce Subcommittee on Internet Hearing, 9-17-08, "The Blind Eye to Privacy Law Arbitrage by Google -- Broadly Threatens Respect for Privacy"
Senate Judiciary Subcommittee On Antitrust, 9-27-07, "Google-DoubleClick Merger and the Online Advertising Industry," "The Google-DoubleClick Anti-competitive Case"
Senate Subcommittee on Antitrust, Competition Policy and Consumer Rights, 10-19-05, "Video and Telecom Competition is Increasingly Vibrant and Here to Stay, Recommendations on Telecom Reform Legislation"
Senate Judiciary Subcommittee on Antitrust, 4-19-05, "Telecom Mergers in a Techcom World: How Antitrust Must Adapt to the Techcom Future"
Senate Judiciary Antitrust Subcommittee, 2-11-04, Oversight Hearing, "Cable Competition - Increasing Price; Increasing Value?" Senate Judiciary Antitrust Subcommittee, 6-18-03, Oversight Hearing, "NewsCorp/Hughes Proposed Merger"
House Financial Services Committee Subcommittee on Capital Markets, Insurance, and Government Sponsored Enterprises, June 18, 2003, 6-16-03, "Mutual Funds Integrity and Fee Transparency Act of 2003"
House Financial Services Oversight Subcommittee, 3-21-02, "Global Crossing's Bankruptcy: A Window Into a Broken System of Protecting Investors"
Senate Commerce Committee, Panel on Consumer Affairs, 12-18-01, Hearing on Enron Bankruptcy, "Conflicts of Interest Are Eroding the Market's Integrity and Internal Controls"
House Financial Services Subcommittee on Capital Markets, 6-14-01, "Who's Looking Out for Investors?" House Judiciary Committee, June 5, 2001, 6-5-01 Oversight Hearing, "House Internet Freedom and Broadband Deployment Act of 2001"
House Judiciary Committee, 7-18-00, Legislative Hearing on H.R. 1686, the "Internet Freedom Act" and H.R. 1685, the "Internet Growth and Development Act of 1999"